Concrete floor slab construction process includes erection of formwork, placement of reinforcement, pouring, compacting and finishing concrete and lastly removal of formwork and curing of concrete slab. The formwork shall be designed to withstand construction loads such as fresh concrete pressure and weight of workers and operators and their machines. Guide to Formwork for Concrete ACI 347-04 shall be followed for the design of formworks. Furthermore, different materials such as wood, steel, and aluminum can be used for the formworks of concrete floor slab. 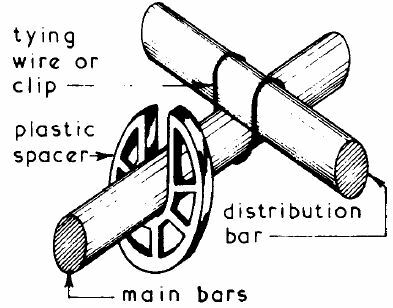 Use of damaged or inferior lumber having lower strength than needed. Prior to the placement of reinforcement for concrete floor slab construction, inspect and check forms to confirm that the dimensions and the location of the concrete members conform to the structural plans. Added to that, the forms shall be properly cleaned and oiled but not in such amount as to run onto bars or concrete construction joints. Design drawings provides necessary reinforcement details, so it only needs understanding to use designated bar size, cutting required length, and make necessary hooks and bents. 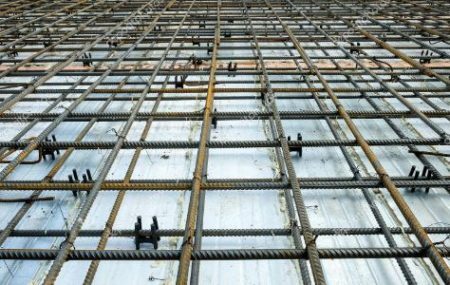 After preparation is completed, steel bars are placed into their positions with the provision of specified spacings and concrete cover. The concrete cover and spacing for floor slabs can be maintained by introducing spacers and bars supporters. Wires are used to tie main reinforcement and shrinkage and temperature reinforcement (distribution reinforcement). It should be known that incorrect reinforcing steel placement can lead to serious concrete structural failures. 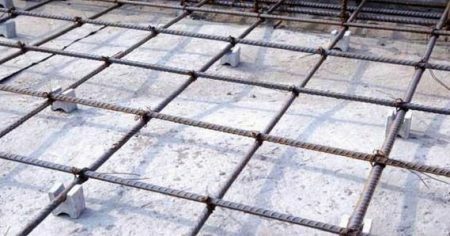 Improper concrete cover exposes reinforcement bars to danger and jeopardize concrete-steel bond. Finally, after all requirements of reinforcement placements (positions, concrete cover, spacing, and correct bars size; length; hooks; and bending) are finalized, then site engineer can order concreting. Mixing, transporting, and handling of concrete shall be properly coordinated with placing and finishing works. 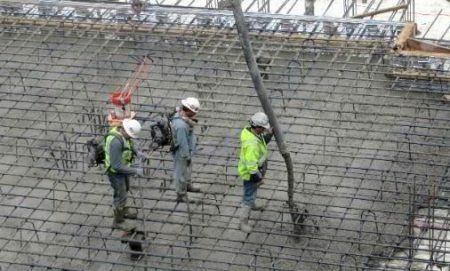 In floor slab, begin concrete placing along the perimeter at one end of the work with each batch placed against previously dispatched concrete. Concrete should be deposited at, or as close as possible to, its final position in order to prevent segregation. So, Concrete placement in large and separate piles, then moving them horizontally into final position shall be prevented. Moreover, site engineer shall monitor concreting properly, and look for signs of problems. For example, loss of grout is the indication of improper sealing and movement of joints. Added to that, cracking, excessive deflection, level and plumb, and any movement shall be checked and tackled to prevent further problems. 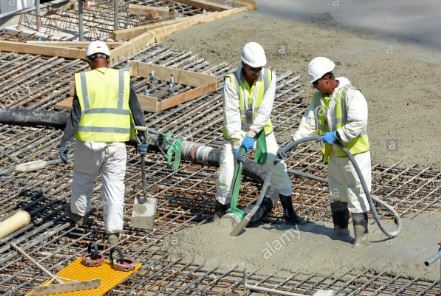 Furthermore, fresh concrete should be compacted adequately in order to mold it within the forms and around embedded items and reinforcement and to eliminate stone pockets, honeycomb, and entrapped air. Vibration, either internal or external, is the most widely used method for consolidating concrete. Lastly, slabs could be finished in many ways based on floor application. Helpful information about forms before, during, and after concreting can be found in ACI 311.1R. After finishing ended, suitable technique shall be used to cure the concrete adequately. 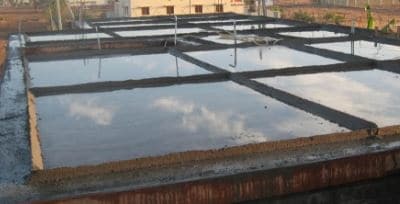 Slab curing methods such as water cure; concrete is flooded; ponded; or mist sprayed. In addition to water retaining method in which coverings such as sand; canvas; burlap; or straw used to kept slab surface wet continuously, chemical Membranes,and waterproof paper or plastic film seal. 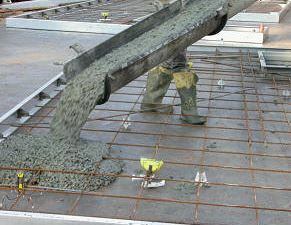 Regarding curing, it is recommended to remove formworks after 14 days. For detailed formwork removal time, Please click here. 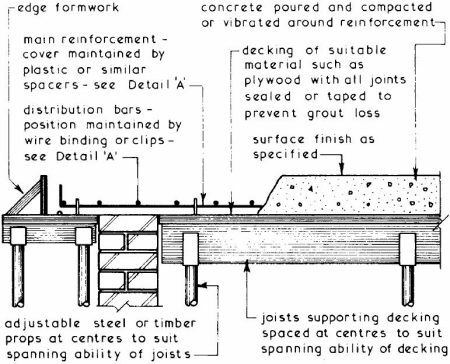 All construction process of concrete floor slab are illustrated in Fig.8 and Fig.9.